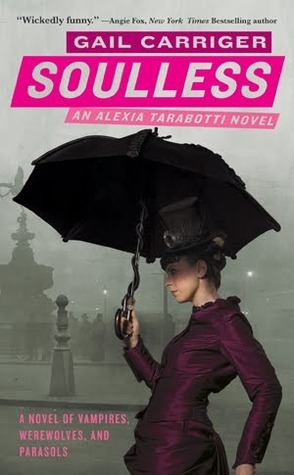 I feel as though I am very behind the times, but I am just now reading Soulless by Gail Carriger. My expectations are very high given that I have heard so many good things about it! "This has got to stop," she insisted. "We are in danger, remember? You know, ruination and tragedy? Calamity just beyond that door." I don't know, this sounds like a bit of a drama queen. What calamity could possibly be behind a door? Good teaser! I have this one and haven't read it yet. I need to do that soon, as I have heard that it, and its sequels are really good! Great teaser today! It inspires me! Love that sarcastic tone. Sounds fun. I also wanted to welcome you to What's in a Name 5. Hope you have fun with it. I have this one too, but still need to read the first to get to this one. I'm so glad you are reading this one. I've loved the series so far. Hope you are enjoy it. I haven't heard of this one. Thanks for sharing the teaser. If you get a chance, mine is here. I loved Soulless! I think I must have giggled all the way through it. I love--LOVE--the first scene where she's attacked by a vampire, and she's not bothered by the fact she was attacked, but by the fact that it was so outrageously rude, and that a perfectly good treacle tart was destroyed.